For Bosch Gen2 or Yamaha Syncdrive (with RideControl EVO or CHARGE Displays) or PW-SE/PW-X. The improved BlackPed+ module optimizes Bosch and Yamaha engines up to a speed of 75 km/h. The related app provides access to many features, values and setting options. BlackPed+ is a brand new tuning module for electric bikes driven by Bosch Gen 2 (Active / Performance / CX) or Yamaha Syncdrive (Giant) systems with RideControl EVO or CHARGE displays or PW-X/PW-SE. This tool is the optimized version of the established BlackPed tuning module, and it has much more features. Like the “normal” BlackPed module before, the BlackPed+ device can be conveniently controlled with a free Smartphone App, and this enables a great range of functions (Android & iOS, wireless via Bluetooth). For example, the peak maximum of the engine support can be set individually from 15 km/h (=9 mph) up to 75 km/h (=46 mph). Especially noteworthy is that the BlackPed+ App can display a very large amount of parameters / data on your Smartphone. In principle, the BlackPed+ will turn your Smartphone into a Bosch NYON display! 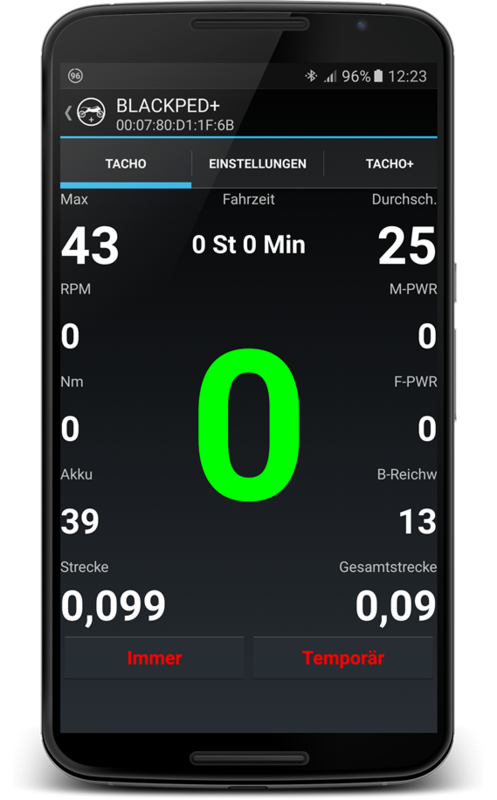 That means: >From now on, users of Yamaha GIANT or Bosch Gen2 electric bikes with Intuvia display can enjoy all advantages of the sophisticated Bosch NYON displays via the Smartphone app. This is possible because BlackPed+ can receive data directly from the CAN bus (and forward them to the Smartphone). Another advantage of the BlackPed+ is that it does not have to be connected to the electric bike´s light socket anymore – that means, you do not need a special Y-cable to install the device anymore. However, it is still possible to activate the module via the light switch, the WALK button or via the App. 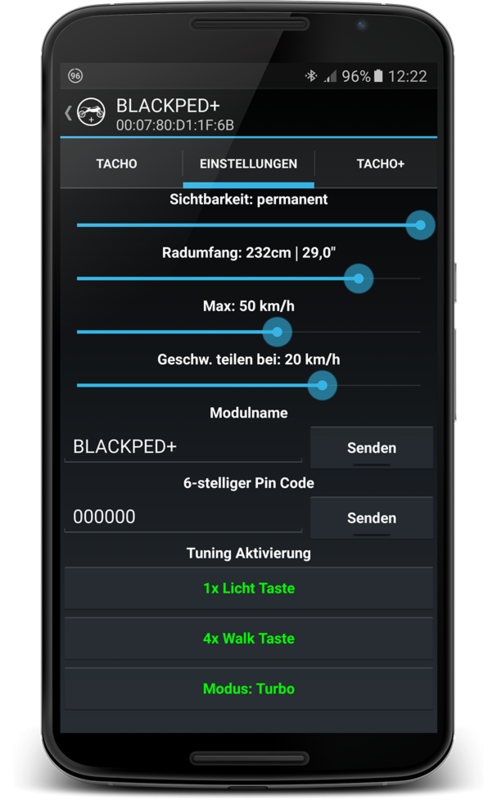 Important hint: In principle, the Smartphone App is only needed once to determine the settings of the BlackPed+ module. All the specifications will be automatically saved (and can be adjusted at any time). Due to the fact that the BlackPed+ module can also be activated via the light- or WALK-buttons, you do not have to take your Smartphone with you each time you want to use your electric bike. Special tip: If the BlackPed+ module is activated, your electric bike display won´t show the correct speed and kilometres anymore. But this is no problem because your Smartphone display can show you all the correct data via the BlackPed+ app. 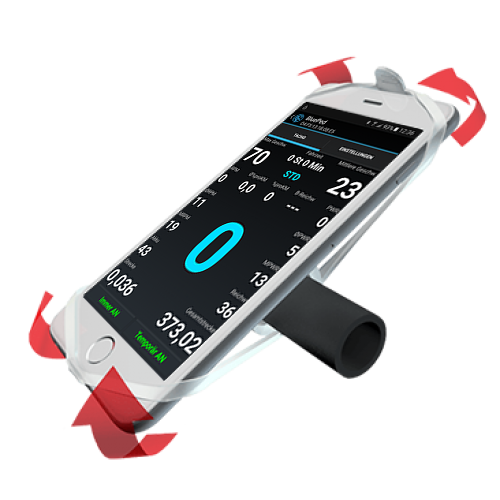 For this reason, we recommend you to order the optional FINN Smartphone holder for the bicycle handlebar as well. This enables you to have a good view on your Smartphone display while you are on the road. You can also order a suitable charging cable for your Smartphone, too. This enables you to charge your Smartphone via the electric bike battery while you are riding. The BlackPed+ module is made in Germany. The installation of the BlackPed+ is very simple and can be easily carried out by technical amateurs, too. Simply insert the module between speed sensor / display and engine. After the connection of all plugs, the module has to be placed directly in the bicycle frame respectively inside the engine´s impact protection. - Determine the maximum level of the engine support from 15 to 75 km/h. - Determine the speed at which the tuning shall be activated (“Divide speed at”). - Wheel size: Specify this value to make sure that current speed and kilometres driven can be calculated properly – this makes sure the Smartphone app will display the data correctly. - PIN Code: You can enter a PIN code to protect the module from unauthorized access (factory state PIN “000000”, you have to enter this code when you connect your Smartphone and the BlackPed+ module for the first time). - Change between km/h and mph. - Visibility (between 0 and 240 seconds or, optionally, permanent). - Enter a module name. Furthermore, it is possible to determine how the module shall be activated. You can specify an individual combination of light-button, WALK-button and the engine support mode “TURBO” (Bosch engines) or the support mode “SPORT” (GIANT engines). Alternatively, you can activate the tuning directly via the app (“Temporär / temporarily” button) – but this is not possible anymore if you have already chosen one of the three options mentioned before. Furthermore, it is being indicated if the tuning is currently active or not (temporarily On/Off). 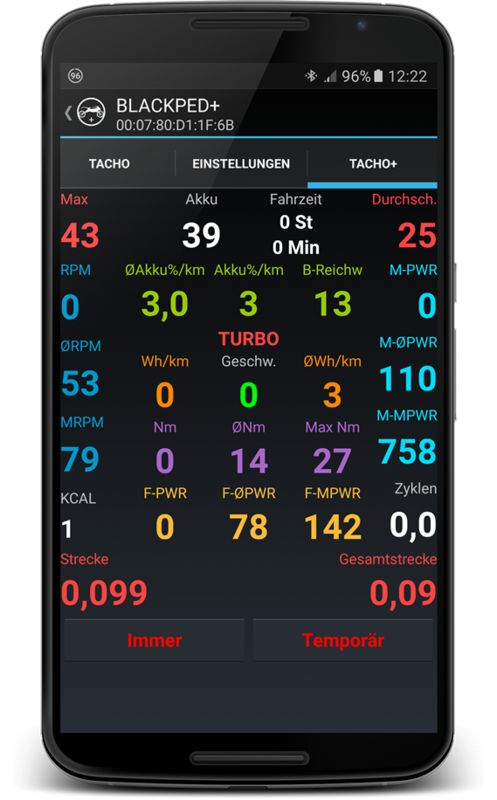 Hint: The BlackPed+ app for iPhones shows some additional parameters, namely “M-PWR” (current engine performance) and “MPWR” (max performance in %). BlackPed+ is compatible with “normal” electric bikes with engine support up to 25 km/h, as well as with faster S-Pedelecs with engine support up to 45 km/h (or more). 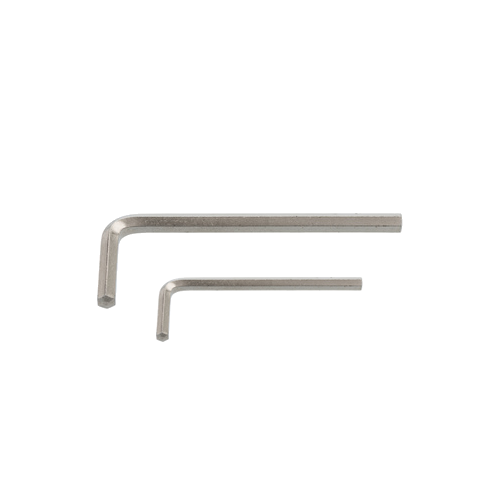 Bosch Active & Performance Line: Crank Remover. Our tip: Before you order the BlackPed+ module, you should download the BlackPed+ app to check out if it really runs on your Smartphone. If this is the case, you can order the module immediately and make your electric bike faster. By the way, the installation of the BlackPed+ module is very easy. There are no special technical skills required. Due to the fact that no cables will be damaged during the installation process, the electric bikes original state can be restored at any time.